Remove the right and left windshield side garnish moldings. 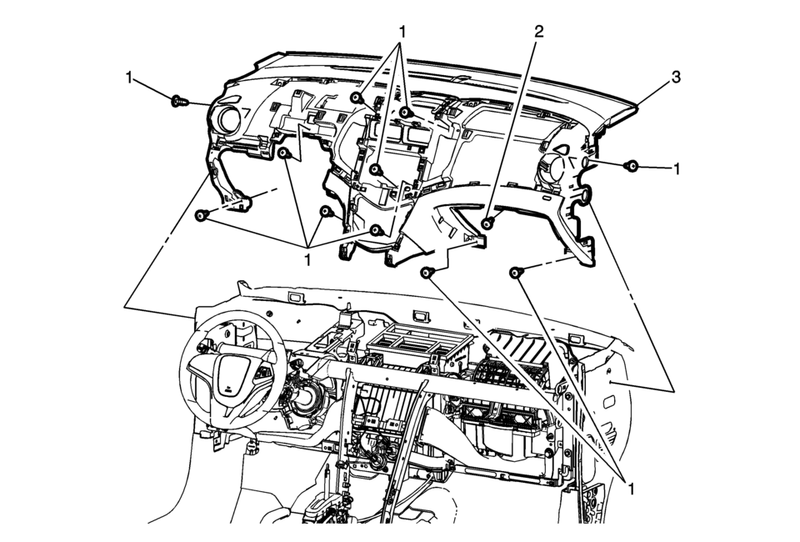 Refer to Windshield Side Garnish Molding Replacement. Remove the front floor console assembly. Refer to Front Floor Console Replacement. Remove the right and left instrument panel upper trim panels. Refer to Instrument Panel Upper Trim Panel Replacement - Right Side and Instrument Panel Upper Trim Panel Replacement - Left Side. Remove the radio assembly. Refer to Radio Replacement. Remove the heater and air conditioning control assembly. Refer to Heater and Air Conditioning Control Replacement. Remove the instrument panel lower intermediate reinforcement. Refer to Instrument Panel Lower Intermediate Reinforcement Replacement. Remove the instrument panel knee bolster. Refer to Instrument Panel Knee Bolster Replacement. Note location and routing of the instrument panel electrical harness assembly in order to ensure proper installation. With the aid of an assistant lift the instrument panel assembly rearward and upward away from the tie bar assembly. Remove the instrument panel assembly from the vehicle. When replacing the instrument panel assembly, transfer all necessary components.